This next section of Asteroids begins with five of the health asteroids. These asteroids each work with our health and since health is complicated, these asteroids are only the tip of the iceberg. The meanings for each vary only in connection with other asteroids they work with. It would be the other planets or asteroids, Transneptunians that would give greater detail about the health issue. An example might be one of these asteroids along with Pluto could be referring to constipation or issues with the bowels, if in aspect to Hades it could be a bacteria or a deteriorating situation. 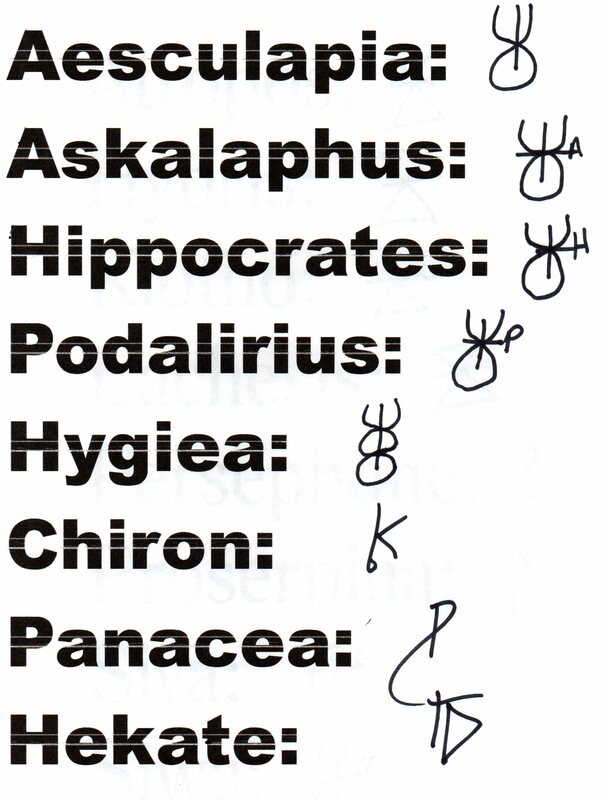 All these asteroids glyph is based in the health and medical snake with the staff. Hygiea is the one that looks the closest to the glyph we have all become accustom to. The others are short versions only the top of that glyph with a horizontal line and the letter that applies. Aesculapia: Just the top of the staff is used with the horizontal line alone. Askalaphus: The horizontal line comes with an A at the end. Hippocrates: The horizontal line is followed by an H.
Podalirius: That horizontal line is followed by a P.
Hygiea: This asteroid is also more about one’s well-being as much as their health. Here you can also see unhealthy circumstances or environments, as in the idea of “cleaning things up.” This glyph looks much like the traditional medical glyph. Chiron: Ironically this is also affiliated with medicine but it is so much more. Chiron is the alternative, and that includes alternative medicine. Chiron is also a healer, but he is also a teacher. In a chart, Chiron is often associated with turning points in a persons life. Aspects to Chiron can bring vast changes. But Chiron is also that which is different and therefore the usual rules cannot always apply. The glyph looks like a small letter k with a ball at the bottom of the vertical line. Panacea: Here is the idea of solutions or fixes. So with the medical asteroid this would point to a fix or solution. But with Panacea it is any situation where a resolution or solution is necessary. The glyph looks like a musical clef, or an over done capital P.
Hekate: The asteroid of wisdom, inner wisdom. Here is our intuition on a gut level. She is also associated with dreams and dreaming. The glyph is a moon with a vertical line in front of the moon and a horizontal line that crosses the vertical line and covers the moon.